Do something about your network nightmare. Change it. Nothing is more frustrating to a company than a network that goes down or slows to a crawl. 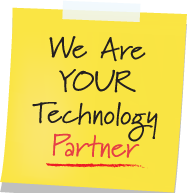 At Vantage Point, we make it our business to keep your network performing at its best. That can mean standardizing hardware and systems, supporting mission-critical applications, or managing servers to avoid capacity problems. Or all of the above! And because data security is one of the biggest threats to network performance, we offer powerful file backup and business continuity solutions and keep your security hardware and software updated to keep intruders out.